IPS has the widest variety of solenoid valve technology to meet your valve requirements. 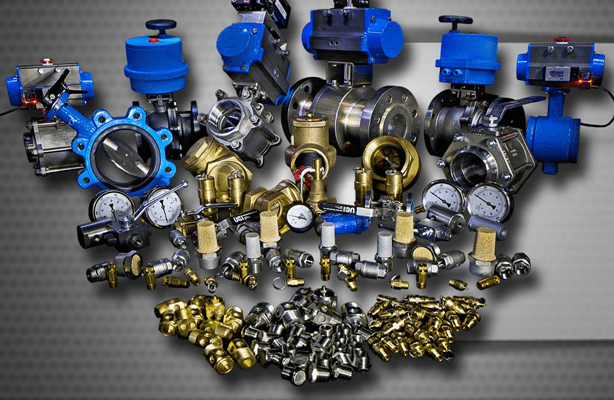 We offer 2, 3, 4, 5 way designs in stainless steel valves, brass, and plastic including all voltages. Valves have UL, CSA, CE, and ratings. We also offer standard and custom manifolds for most types and materials. When a solenoid valve cannot handle the application, we offer automated ball, butterfly, piston, angle seat, diaphragm, and sliding gate designs to meet the more agressive applications. Our automated valve series is available in air operated actuators or electric actuators. The valves can be stainless steel, carbon steel, cast iron, brass, or plastic. We can often ship same day or next day to meet your requirements. Flowmeters, batch controllers, pressure regulators, plastic ball valves, diaphragm, check, butterfly actuated valves. Actuated valves in stainless steel, brass, and plastic. Ball , V-port, butterfly, solenoid, and pinch valves. Pneumatic and electric actuators, limit switches. For further information such as data sheets and other downloads, click the links below. Integrated Process Solutions has the widest offering in automated valve technology. The offering ranges from actuated ball & butterfly valves to one of the widest selections of electric solenoid valves. The ball valves can be supplied in brass, stainless steel, carbon steel, or a variety of plastic to include PVC ball valves and options for CPVC, polypro, PVDF. These actuated ball valves can be set up for on/off or regulation for applications such as pressure, flow, or temperature control. For these regulating applications we utilize the proven Vport design in the ball. The same applies for the butterfly valves. They can be set up for on/off or butterfly control. IPS has become one of the largest solenoid valve suppliers in the USA. These include brass solenoid valves, stainless steel solenoid valves, plastic solenoid valves. Within each material are special certifications such as explosion proof solenoid valves, NSF solenoid valves, UL Listed solenoid valves, latching solenoid valves, steam solenoid valves, and special designs of water solenoid valves. Our 30 years of automated valve experience can assist you in selecting the correct technology and ensure a very competitive price. We have the best pricing in the industry for stainless steel solenoid valves which includes hard to find zero differential designs and NSF ratings on 1/2″ – 1″. Soon the NSF solenoid valves will be available in 1/2″ – 2″ in stainless steel, plastic, and brass. IPS has very long-standing relationships with the factories we work with and we can get them to design or modify standard actuated valves and solenoids to meet your exact requirements. Private label opportunities are always available for our OEM customers. Click here to view/download our latest brochure!